Chival – Yoga, Permaculture et Animaux – Yoga, Permaculture et Animaux "prendre soin de la terre et du vivant, de l'humanité et des animaux, et partager les merveilles de la connaissance, du savoir-faire et de l'abondance"
and sharing the wonders of Knowledge, Skills, and Abundance. Born under the impulse of Love, Chival is a return to our roots, a quest for harmony and serenity around nature, a lucid and benevolent look at your inner self, and an invaluable opening to the world. 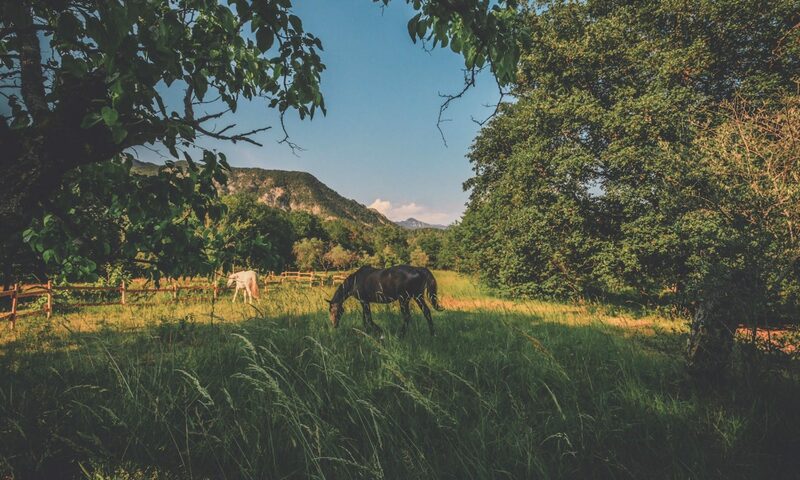 Under the sun of the hinterlands of Nice, surrounded by majestic mountains and invigorating rivers, it is a preserved and wild space where plant and animal biodiversity can freely flourish. The CHIVAL association brings together yoga (universal philosophy, practice of postures, breathing, meditation), permaculture (natural, resilient and sustainable agriculture, food, energy and material self-sufficiency, eco-construction, mutual aid); and animals (recognition of animal sensitivity, plant-based food, conservation of natural and wild areas, protection of terrestrial and aquatic biodiversity, inter-species solidarity). Between May and October, you could spend a week or more in the renovated shepherd’s cottage, more than two centuries old, near the charming village of Villars sur Var. Find out the available dates for various retreats and conferences that take place throughout the year in the schedule tab to come and experiment, practice and promote concrete solutions to meet the challenges and basic needs of humanity and its children, while protecting the planet and its environment, as well as the many species that compose it. An experimental science for deconditioning consciousness, Hatha Yoga awakens the higher centers to allow the evolution of human consciousness. Ha and Tha, Sun and Moon, are brought to a state of balance in order to open the middle path. The physical body is purified through the practice of shatkarmas (purification), asana (posture), pranayama (breathing), mudra (gesture), bandha (lock) as a prelude to Raja Yoga and samadhi (realization). A true pacification tool for the mind, sounds, mantras and instruments allow us to connect to subtler frequencies, inviting us to remodel interior spaces in symbiosis with the cosmic space leading to a state of peace, healing and joy. Through sound, we enter into resonance with the universal laws. The “Yoga of dreams”, yoga nidra is a deep and guided relaxation, performed in a lying position. The nidra covers the entire spectrum of brainwaves (delta, theta, alpha and beta) by acting on your subtle bodies. It helps to control the various stages of sleep and gradually access the subconscious, whose influence is usually exercised without your knowledge. The practice makes it possible to explore the unconscious and thus to know oneself better so as to be able to redirect the forces of one’s deep personality. Yin Yoga is based on a series of postures that are maintained for 3 to 5 minutes, which promotes the release of deep connective tissue (ligaments, tendons, fascias …) through the relaxation of muscle and nerve tissue. This gentle practice acts on your physical, emotional, mental and energetic bodies. Between active tension and relaxation, each posture then becomes a posture of meditation in itself. Today, we use the equivalent of four planets to live in a French way, seven to live in an American way. Our Western way of life has become the reference model for all human populations. In this gigantic short-term system, less than 10% of the world’s population holds 83% of the World’s resources. Our civilization is hurrying towards its potential extinction. As we continue to drink, eat, live, play, and move as we do, we are over-consuming the planet’s ecosystems and resources, which are losing their precious ability to regenerate themselves: massive deforestation, declining plant and animal biodiversity, war, water shortages, ocean acidification, sterile soils, diseases of civilization, recurring crises, waste accumulation, social inequality, famine, disenchantment of the world, media manipulation and the critical rise of greenhouse gases in the atmosphere are at work. We are at war with the human race, at war with the forests, at war with animals, at war with our own values ​​and common sense. We could easily sink into pessimism, give in to anger or accelerate the process of destruction if we keep consuming as we do. There are as many definitions of permaculture as there are people. Trying to define permaculture is a bit like trying to define life. Permaculture is a code of ethics, a philosophy, a science, a method and an art of designing, developing, planning and organizing living spaces, systems and functional ecosystems. The fundamental concern of permaculture is caring, sustainability, efficiency, resilience, and sharing. In line with the free and powerful forces and spontaneous processes of regeneration and self-regulation of natural systems, it uses ancestral knowledge as well as modern knowledge to make its home in a wider sense (its body, its home , its village, its region, its country, its planet) a harmonious, nourishing, autonomous, ecosystem that respects nature and all its inhabitants. Our project fits in the short term of pleasure, the middle term of fulfillment, the long term of the planet, and the inexistence of the time of the Wise. The more complex the tools used by societies, the less the livelihoods of individuals remain within their reach. The resulting loss of generalized self-sufficience (“alienation”) allows the unlimited exploitation of anything that lives on this planet. To promote concrete ecology and sustainable autonomy by meeting basic needs: to feed, to live, to love, to flourish, and not to pollute. To provide effective solutions against global warming and the destruction of the planet (agriculture being the first source of greenhouse gas, far ahead of transport and construction.) Find out how here. To fight against wars and voluntary servitude by helping everyone to work on their universal human qualities and to use emancipation and commitment to a benevolent transition. At the beginning of an adventure that promises a wealth of learning, smiles, introspection, creativity and sharing, you can keep up to date with the upcoming opening of Chival. What if there was a way to solve most of the ills of our planet, would we be willing to do it? How can we maximize our positive impact on the planet and its inhabitants? How can we save millions of lives without being a doctor or working in the humanitarian field? How can we save the planet, its animals, its oceans, its forests, its atmosphere without being a biologist, a physicist, a head of state, or a billionaire? Well, strange as it may seem … we just need to stop eating animals. Because animals are sentient beings, so they should not be considered as ordinary goods. Our logic is to reduce the rate at which we destroy the planet, and to extend compassion to all living beings.